Some of the tactics are broad and political, like investing in efforts to undermine democracy through voter suppression and other means, or like financing political campaigns and “investing in” politicians at local, county, and state levels. Other tactics are even more discreet and deceitful, like claiming that regulations that would benefit heavily polluted communities will cause these same communities economic harm.Or, in other instances, denying the reality of air and water pollution, or even shifting the blame for this pollution to those disadvantaged communities that are suffering the impacts of fossil fuel projects.“One of the most duplicitous strategies of the fossil fuel industry is manipulating messaging which feigns concern for the welfare of low income and communities of color. This is a self-serving effort to maintain their wealth,” said Kathy Egland, Chair of the NAACP National Board Committee on Environmental and Climate Justice, in a statement. Though few in the crowd knew it, the concert had a powerful sponsor: Fueling U.S. Forward, a public relations group for fossil fuels funded by Koch Industries, the oil and petrochemicals conglomerate led by the ultraconservative billionaire brothers David H. and Charles G. Koch. About halfway through the event, the music gave way to a panel discussion on how the holidays were made possible by energy — cheap energy, like oil and gas. Patterson emphasizes that these tactics can only work if groups like the NAACP and its local partners aren’t aware of the true human and economic costs of fossil fuel exploitation, or if they’re not willing to push back against it. The report describes at length the health and financial harms that coal, oil, and gas bring to the communties they cross, and how these harms are disproportionately impacting people of color. The Michigan Technological University campus is located in Houghton, Michigan, in the state’s Upper Peninsula — which has some of the highest electric rates in the U.S.
A research paper says Michigan utilities use political power to deter distributed generation — and regulators let them. A study published last month by Michigan Tech researchers says utilities in the state are using their political power to put up barriers for customer-owned solar panels and other potentially cost-saving distributed generation. Net metering is an especially contentious issue in Michigan as at least one major utility seeks to drastically lower the amount it credits solar customers for sending power back to the grid. Michigan Tech researchers say that not only do these customers provide net value to the grid, but the state also has an unnecessary cap on who can participate. The paper concludes that investor-owned utilities “manipulate regulatory regimes” through political lobbying and testimony before state regulators to favor centralized fossil fuel production. While it’s perhaps unsurprising utilities would advocate their own interests, “for me, it’s the extreme ways and extent they go to to keep the system the status quo,” said Emily Prehoda, the study’s lead author and doctoral candidate in environmental and energy policy. Prehoda is also a policy analyst for Chart House Energy, a West Michigan-based solar developer. The utilities’ financial interests are at odds with customers, the researchers say, evidenced by steadily increasing electric rates in Michigan. And while Consumers Energy and DTE Energy have publicly pledged higher renewable energy and emission-reduction targets than mandated, critics say utilities want to own it. The Michigan Tech researchers considered recent legislation and several rate cases at the Public Service Commission involving net metering, electric choice and avoided cost rates included in Public Utility Regulatory Policies Act contracts. Ultimately, utility positions are not only blocking more distributed generation but also preventing customers from lowering their bills, researchers say. 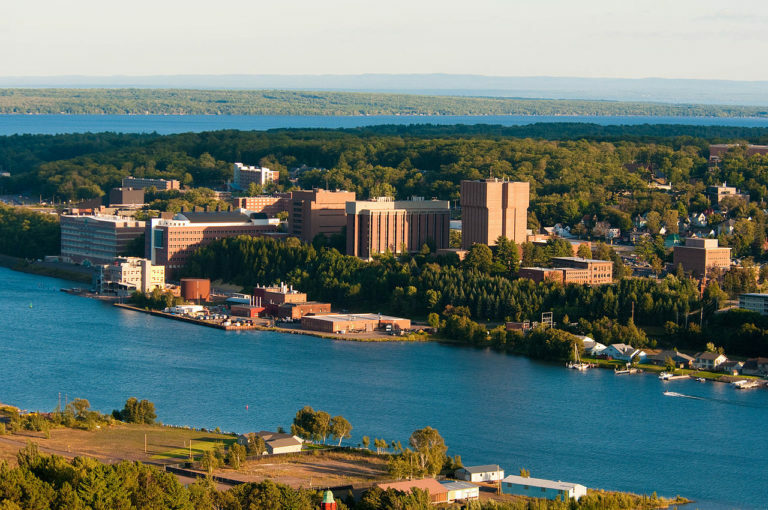 The university is in the Keweenaw Peninsula in Michigan’s Upper Peninsula, which has some of the highest electric rates in the nation. The area utility, Upper Peninsula Power Co., is the only one in the state to hit its 1 percent cap on customers’ net metering participation. Over the past few weeks, DTE Energy and Consumers Energy officials have publicly faced questions on their net metering positions. On March 12, DTE President and Chief Operating Officer Jerry Norcia testified before the state Senate Energy and Technology Committee about the utility’s long-term energy plans. Detroit-area advocates have also pushed back against DTE’s claims, saying that the utility hasn’t fully considered the benefits of rooftop solar, and that the company’s rate increase under consideration by regulators disproportionately impacts low-income customers. An administrative law judge has recommended rejecting DTE’s proposed fees on net metering customers. Critics cite multiple studies showing net metering customers provide net benefits to the grid. Utility messaging on net metering, Prehoda added, sends a negative signal about self-generation, particularly among low- and moderate-income communities. “I think it’s wrong and the message they’re promoting is hindering distributed generation proliferation,” Prehoda said. Under 2016 energy laws, utilities are required to file new distributed generation programs to replace net metering. The Public Service Commission has agreed on an inflow-outflow model that charges customers for the power they use from the grid (inflow) and credits them at an as-yet underdetermined rate for the power they send back (outflow). Amid the distributed generation program discussions last year, state lawmakers proposed legislation that would restore net metering, though it never came to a vote. Jessica Woycehoski, Consumers’ electric supply resource planning lead who was part of the climate change panel in Grand Rapids, said she “can’t say where the company’s position is” on restoring maintaining net metering or lifting the 1 percent participation cap. An audience member criticized major utilities for effectively limiting customers’ choices for producing their own power, and asked panelists to respond. For now, that leaves the policy discussion among utilities, advocates and regulators at the Public Service Commission. Prehoda said she is “optimistic” about the direction of the commission. In February, Gov. Gretchen Whitmer appointed Dan Scripps to the three-member board. Scripps was program director for Midwest policy at the Energy Foundation and has advocated for distributed generation. Whitmer will have the opportunity to appoint another member to the board this summer when Commissioner Norm Saari’s term expires. Saari is a former lobbyist with Consumers Energy who retired in 2006. “It’s going to present some opportunities to at least further the conversation and bring more balance of power,” Prehoda said.